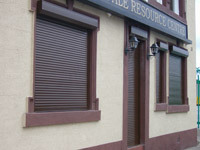 Are you a business or have property in the Manchester area looking to have economical security shutters installed? Our roller shutters not only provide an excellent barrier against intruders but also deters vandalism. By installing a security shutter across a door or window it not only helps to deter and prevent a burglary from occurring, it also stops the damage caused by vandals breaking glass or damaging the door. 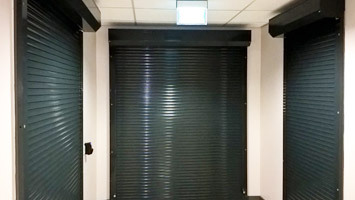 As a local company near Manchester we can survey, supply and install either manual or electric roller security shutters for home or business premises including internal bar servery, kiosks and counters. 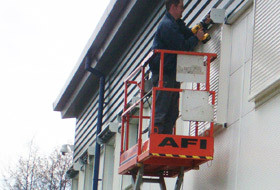 We can also install fire shutters in the Manchester area which provide a fire rating of up to 4 hours. All come with either with a standard 'mill' finish or a fully powder coated colour. You can view the range of colours here. 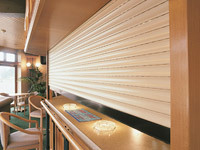 Our roller security shutter doors can be installed with solid, perforated, punched or glazed facing (lath). 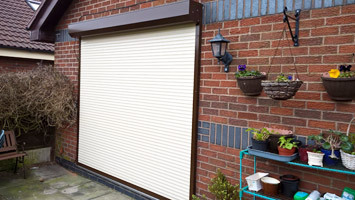 For high security situations we can supply a range of Excel security roller shutter doors tested to conform to the police secured by design standards and those recommended by insurance companies. First for roler shutter doors Manchester. 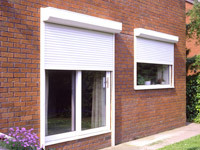 Installers of security roller shutters Manchester, security grilles and roller garage doors Manchester covering Rochdale, Oldham, Bury, Bolton, Stockport, Manchester, Wigan, Ashton, Trafford and Stretford, Middleton, Crumpsall, Blackley, Moston, Beswick, Collyhurst, Miles Platting, New Moston, Hulme, Rusholme, Harpurhey, Alkrington, Stretford, Holts, Glossop, Uppermill, Saddleworth, Greenfield, Grotton, Urmston, Sale, Altrincham, Hale, Cheadle, Hazel Grove, Denton, Audenshaw, Hyde, Dukinfield, Stalybridge, Swinton, Prestwich, Whitefield, Radcliffe, Royton, Chadderton, Failsworth, Manchester, Marple, Bredbury, Romiley, Littleborough, Wardle, Eccles, Irlam and Bramhall.